You'll be £19.99 closer to your next £10.00 credit when you purchase Falklands Hero. What's this? At the height of the bitter battle for Mount Longdon during the Falklands War , 3rd Battalion, Parachute Regiment’s assault has stalled in the face of determined resistance. With his platoon held up by an Argentine machine gun, it falls to Sergeant Ian McKay to act. The machine gun has to be silenced to break the deadlock. Gathering a small group together, Ian McKay leads them in a headlong dash into the teeth of a withering fire. One by one they fall until only Ian McKay is left, charging on alone towards the Argentine gun and a place in history. His was the final act of a man who lived, breathed and was shaped by the Parachute Regiment: an act which earned him a posthumous Victoria Cross. This is the story of Ian McKay: the last British hero of the Twentieth Century. Pages of newsprint were devoted to his brief, brave life story. Much of what was published was superficial, wide of the mark or, as Jon Cooksey's outstanding new biography makes clear, pure invention. Cooksey has produced a multi-layered portrait of a dedicated professional soldier who was far from being the archetypal rough-hewn paratrooper of popular mythology. A good, gripping narrative of events. Ian McKay is well known as the paratrooper who was posthumously awarded a Victoria Cross for his attempt to break Argentine resistance on Mount Longdon during the Falklands War. This biography also explores his earlier life, from childhood and joining the Army in 1970, to that fateful night on the 11/12th June 1982, and it reveals a man who was shaped by the Parachute Regiment to such a degree that this book can be considered as much their story as it is his. Jon Cooksey thoroughly describes the parts which McKay and 3 PARA played in the Falklands campaign, but he also goes into considerable detail regarding his earlier army career, including service in Northern Ireland. McKay had the misfortune to be on the streets of Londonderry on the 30th January 1972, and there follows a most detailed description of the events of what has become known as Bloody Sunday, during which McKay was slightly wounded by an acid bomb and fired two shots at his unharmed assailant. Cooksey gives an account of the resulting inquiry, in which McKay gave evidence as "Private T", which completely exonerated the Paras, and he goes on describe the Saville Inquiry of 2010, which, 28 years after the event, managed to contrive an altogether different conclusion, yet one which personally cleared "Private T" of any wrong-doing. For anyone interested in the Falklands War and the Parachute Regiment of the 1970's and early 80's, this is essential reading. This book is not just a record of the actions of one brave man, it is a tribute to the determination of the British troops that fought on Mount Longdon that cold night thirty years ago. Though it was Ian McKay that led the charge against the Argentine positions, his men followed him unquestioningly. They too were heroes. Victoria Cross winner Ian McKay played an important role in not one but two big moments in British history, a new book on his life reveals for the first time. 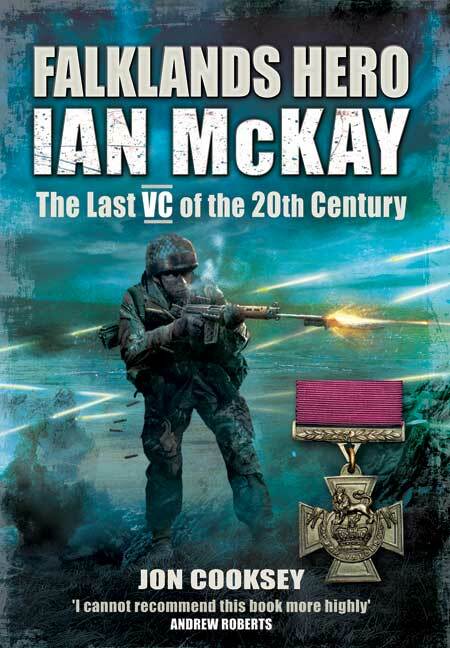 In an extract from his new book, Jon Cooksey celebrates the life of Sgt Ian McKay, war hero and the last Yorkshireman to be awarded the Victoria Cross. A British soldier who won a post-humous Victoria Cross for his courage in the Falklands conflict was one of those at the heart of the Bloody Sunday massacre. McKay's role is documented for the first time in a biography, Falklands Hero, by the historian Jon Cooksey. Both McKay's surviving family and comrades gave interviews and documents to the author, confirming his involvement in Bloody Sunday. At the height of the bitter battle for Mount Longdon during the Falklands War, 3rd Battalion, Parachute Regiment’s assault has stalled in the face of determined resistance. With his platoon held up by an Argentine machine gun, it falls to Sergeant Ian McKay to act. It earned him a posthumous Victoria Cross, the last of the 20th Century.